Axonal regeneration is inhibited by a plethora of different mechanisms in the adult central nervous system (CNS). 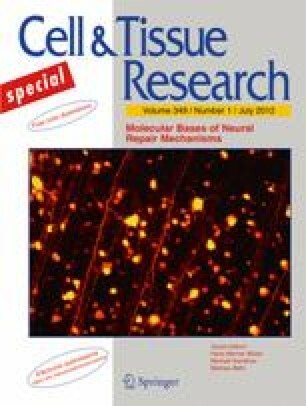 While neurotrophic factors have been shown to stimulate axonal growth in numerous animal models of nervous system injury, a lack of suitable growth substrates, an insufficient activation of neuron-intrinsic regenerative programs, and extracellular inhibitors of regeneration limit the efficacy of neurotrophic factor delivery for anatomical and functional recovery after spinal cord injury. Thus, growth-stimulating factors will likely have to be combined with other treatment approaches to tap into the full potential of growth factor therapy for axonal regeneration. In addition, the temporal and spatial distribution of growth factors have to be tightly controlled to achieve biologically active concentrations, to allow for the chemotropic guidance of axons, and to prevent adverse effects related to the widespread distribution of neurotrophic factors. Here, we will review the rationale for combinatorial treatments in axonal regeneration and summarize some recent progress in promoting axonal regeneration in the injured CNS using such approaches. Supported by grants from NIH/NINDS (NS054883), Wings for Life, International Foundation for Research in Paraplegia (IFP/IRP), the EU (IRG268282) and a fellowship to J.M. (Landesgraduiertenförderung).